Now there are loads of shortcuts some granted quite convoluted and at first you will be slower while those key combinations become second nature but it is worth it in the end, believe me. the best way to go about this is to identify your most commonly used shortcuts, jot them down on a post-it note and attach this to your monitor where it is easily visible. As you gain proficiency with one set jot down another set and stick them to your monitor and so on. By the time you run out of space for the post-it notes (4-5) you can probably replace the first one as they’ll ow be programed in and second nature. Save..! Save..! Save..! You can never save to often, this is why this is my number one shortcut. A quick way to navigate round your image. Hold down the spacebar (the cursor will change to a hand icon), click and hold and drag around your image. [Ctrl + N] – Opens up a ‘New Image’ dialogue window. Layers are probably one of the single most important features in Photoshop… in fact in any graphics application Vector of Bitmap, 2D or 3D. Learn their secrets my young Padawan! You can duplicate an entire layer, or, if you have a selection, the selection will be duplicated to it’s own layer. This is probably one of my most used shortcuts, it creates a new layer which is a combination of all the other visible layers together. Great for that fine detail, quick and easy. Very useful when you are performing repetitive processes on multiple images, though if this is the case recording the process as an ‘Action’ which can be repeated with a single click is very useful and for the serious PS Ninja an action can be run on the entire contents of a folder as a ‘Batch’ process… But I digress. Very useful in conjunction with the Marquee tool. Whereas most programs allow you to undo an action [Ctrl + Z] Photoshop allows you to perform multiple undoes, basically moving back through the ‘History’, otherwise you’re just cycling round undo/re-do. 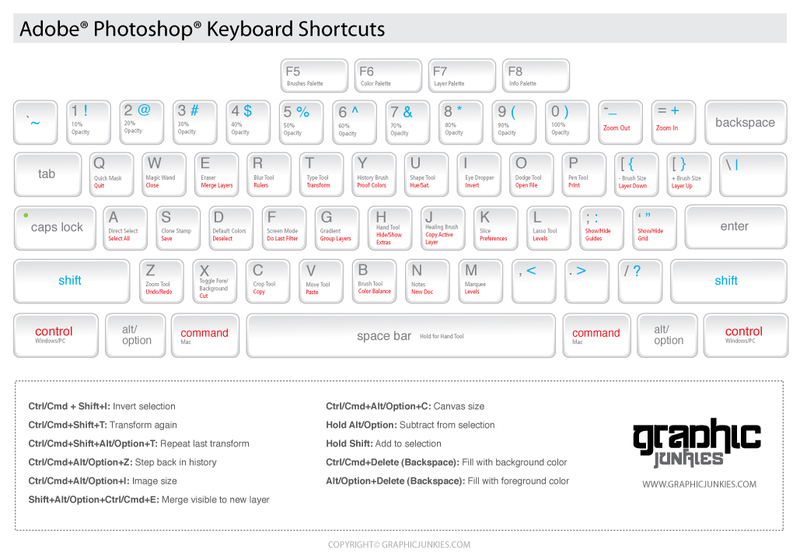 Here are some great online resources for Photoshop keyboard shortcuts. This entry was posted by Blayn on June 16, 2011 at 11:47 am, and is filed under Education, Resources. Follow any responses to this post through RSS 2.0.Responses are currently closed, but you can trackback from your own site.